Imaginando celebrates Portugal's national holiday with a special 40% discount on all LK modules. 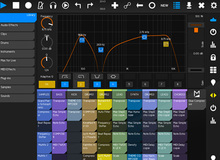 Slate Audio Pro offers users of its Raven touch console with Logic Pro X or Pro Tools a free control app for iOS. Maurizio de Cecco announces the availability of the version for the DSI Mopho hardware synth ot is MidiBlob performance control app for iPad. Cymatic Audio offers uTrack 24 users a free iOS app that allows for remote control of the audio interface via WiFi.